Be Altered to Strengthen Fish Rebuilding? SUMMARY: With an upcoming new FCRPS BiOp, a new EIS and eventually an updated Columbia River Treaty, the region has an opportunity to retool the Columbia/Snake river power system to make it more compatible with the needs of fish while maintaining current beneficial uses. Here we look at what advocates on various sides of the issue have to say about potential changes to the hydro system as they gear up for public meetings beginning this fall in the Northwest. 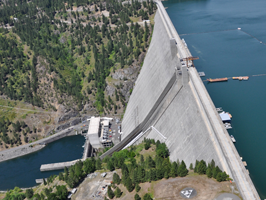 When we talk about changes to the Columbia basin hydro system, many of us assume the conversation is quickly going to segue to drawdown or dam removal. It's true that the state of Oregon, the Nez Perce Tribe and some environmental organizations want to breach the four lower Snake River dams to recover fish populations in the Salmon, Clearwater and other Snake River drainages. We know that. And since U.S. District Judge Michael Simon ordered a new, comprehensive EIS, Snake River dam removal is almost certainly going to be investigated. But what about changes in river operations that would also help the basin's upper and lower Columbia River populations? Are there modifications other than dam removal that would make a difference for these and Snake River stocks? I asked some of the players involved in this decades-long natural resource drama. Here are some of their responses--most of them via email--on a few of the big questions besides dam breaching in the lower Snake. Other than removing dams, the next most controversial proposal is for spilling water for fish. "Spilling water over hydroelectric dams, rather than running it through turbines, is generally seen as the safest method to get the young salmon and steelhead past the dams on their way to the ocean," according to the 10 federal agencies that make up the Columbia River Federal Caucus. The current spill regime for fish--24 hr. spill at eight federal dams from early April to the end of August--stems primarily from a court order over the 2004 and 2008 Federal Columbia River Power System (FCRPS) BiOps. Spill volumes and patterns vary from dam to dam and are currently limited mostly by a cap on the amount of dissolved oxygen produced. At lower Snake and lower Columbia river dams, spill is limited by Washington state rules prohibiting total dissolved gas (TDG) from exceeding 115 percent. Oregon's TDG limit is 120 percent. Save Our Wild Salmon (SOS) supports increasing spill levels, as does the state of Oregon. "Spill has been modeled and proposed at levels as high 125 percent, but has not occurred due to political opposition," Joseph Bogaard, SOS executive director, said. Higher spill levels would require rulemaking by both states, he said. "Yes to more spill," said Oregon Department of Fish and Wildlife's Erick Van Dyke. "Studies have shown that providing additional spill up to a 125-percent TDG spill cap will improve the likelihood of achieving desirable smolt-to-adult return rates (SARs)," said Van Dyke, who is Oregon's representative to the Technical Management Team, the group that advises federal dam managers on fish operations. Bill Tweit, Washington Department of Fish and Wildlife's assistant director, was more circumspect in his response. "Results from the ongoing Cumulative Survival Study point towards the possibility that additional levels of spill for both spring and summer migrants could provide additional downstream migration survival improvements, but there remains some significant uncertainty about these results, and it is not clear that the benefits are similar across all years," he said. "Spill increases survival in low-flow years," he said, "but in other years the benefits aren't as clear." Jim Litchfield, science advisor to Northwest RiverPartners, echoed the element of uncertainty. "Spill is not a simple 'more is better' tool," he said. "It needs to be balanced with passage conditions at each dam." "Also, the region is not of one mind on the relative priority of adult versus juvenile survivals," he said. "I believe that adult fish should be given the highest priority because they have won the salmon lifecycle lottery and are the future promise of the listed populations." Litchfield would prioritize improving passage conditions for adult migrating salmon and steelhead at the dams. Fewer juveniles have been collected and transported below the FCRPS dams since spill operations enhanced in-river conditions for migrating juvenile fish. "Transportation is a highly artificial solution to the problem of increased travel time and elevated river temperatures," said Tweit. "Overall survival is highest by fish that migrate in-river, though there can be species-specific variation," said Bogaard. "Juvenile in-river out-migrants generally return as adults at higher levels than those that were transported in barges." Nonetheless, there was general agreement that, as Tweit said, "there are circumstances and seasons when the transportation program provides clear benefits." Litchfield noted that juvenile steelhead, particularly those migrating in May, benefit from transport. "The precautionary strategy is to continue transport in May to help steelhead and not expect this to help or hurt Chinook," he said. Tom Lohrs, hydraulic engineer and TMT member for the Columbia River Inter-Tribal Fish Commission, asked, "Is there a smarter way to transport juveniles? It's one of the important questions we haven't answered." In terms of changes to the hydro system that can help cool the river, devices recently deployed successfully at the fishways of Lower Granite and Little Goose dams may be useful elsewhere. The devices work by drawing cool water from deep in a dam's forebay and sending it into the fish ladder. "This can only work where reservoirs are temperature-stratified and cool water is there to draw on, which may not be the case in lower Columbia River reservoirs," Bogaard cautioned. For Litchfield, last year's water temperature crisis demonstrated the institutional shortcomings in managing dams to accommodate fish migration ("the search for consensus led to paralysis"). In 2015 Snake River sockeye and Chinook died because of warm water temperatures. "It's easy to see possible changes after the fact, but I think we should be willing to stop spill at Lower Snake dams to pass as much cool Dworshak water downstream as possible," he said. Fish also died by the hundreds of thousands in the Columbia River. "Spill passes water from about 50 feet in depth while the turbines draft from 80 or more feet. Water passed through the turbines would be cooler and could have helped adult fish find cold water refugia," Litchfield said. Lohrs agreed, at least for one-year events. "In situations like 2015, we need to protect upstream migrating adults rather than the juveniles. The juveniles lost would not all be coming back in the same year, so we're not wiping out a whole year of adult returns." "Scheduling basic maintenance on water flow structures, so those activities could be postponed if necessary to avoid loss of existing flexibility to regulate temperatures, is an obvious action to control water temperatures in the mainstem Columbia and Snake," Tweit said. An item worth investigating, Bogaard and others said, is whether, how, and for how much Idaho Power's Hells Canyon Complex could be used to provide cooling flows in the Snake, along with water from Dworshak. Cold water refuges along the mainstem Columbia and in tributaries are being investigated for potential enhancement and, in some cases, rehabilitation by EPA and others. In the mainstem Columbia, fish agencies and tribes have proposed studying changes to current flood control and reservoir refill schedules. A domestic flood risk management review for the basin was endorsed in the U.S. Entity Regional Recommendation on the Future of the Columbia River Treaty after 2024. What needs to be examined, Tweit said, "is whether the current flood control rule curves push out too much water too early in the season, leaving water managers will less water in storage for later in the season. "Less water in storage means lower reservoirs that have less cold water, and lower flows that also contribute to elevating temperatures," he said. In a Oct. 2014 paper, "Ecosystem-Based Function and Integration into the Columbia River Treaty," the 15 Columbia basin tribes call for alterations in reservoir operations at CRT-coordinated dams to revive ecosystem function and improve conditions for resident and anadromous fish and cultural resources. The paper proposes modifications at Mica, Keenleyside (Arrow), Grand Coulee dams and other projects, including Libby and Hungry Horse dams. The range of operational changes, described in two scenarios, "is likely to require adjustments and improved coordination in the U.S. and Canadian power systems to meet essential load and resource balance metrics and for the U.S. to study and adapt flood risk management," the paper says. "The outcome of these operations may also offer opportunities for water supply," it adds. The paper describes the changes as "contributing to a healthier Columbia River ecosystem in the U.S. and Canada while preserving much of the currently altered Columbia River flow regime for hydropower and power system reliability with complementary benefits to recreation, navigation and water supply." That's a vision I hope the region comes to share. Note: NOAA Fisheries and the Action Agencies declined to comment, not wanting to cause a "short-circuit of the process where all this will be discussed," as one spokesman said. Idaho Department of Fish and Game did not respond, and the Nez Perce Tribe is looking forward to contributing its perspective at some future date. Analysis: How Might the Columbia's Hydro System Be Altered to Strengthen Fish Rebuilding?